A new technique has been developed to catch potential new lithography issues when little design data is available for incoming nodes. John Ferguson reviews the key capital metrics you need to review when deciding whether to move to a new process. An alphabet soup of AI, HPC, 5G and the IoT has finally seeded creation of a design infrastructure for silicon photonics. The equipment giant's Computational Process Control strategy takes a pragmatic approach to Industry 4.0 and is likely to influence EDA tools for incoming nodes. The 10nm process will see changes to multiple patterning that demands changes in the implementation flow, along with an increased focus on the effects of variability. 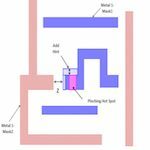 In sessions at the 2015 Design Automation Conference, engineers who had worked on finFET-oriented projects revealed how the technology has changed their design practices and where others may want to think twice about making the move.